Actvity Summary: This core shows an abrupt 30cm layer of silty clay containing preserved pollen and freshwater microfossils. 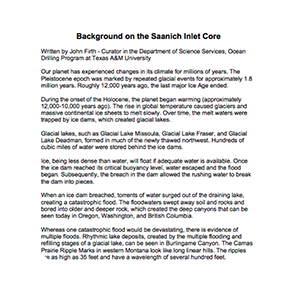 The sediment cored at Saanich Inlet off Vancouver Island, British Columbia contains evidence of catastrophic flooding events – called Jokulhlaups (Icelandic, pronounced o-kul-loop) that took place at the end of the Pleistocene and Early Holocene. This is when the Ice Age came to an end and increasing global temperatures caused glacial dams to form large lakes that eventually drained dramatically when the dams melted and broke. This core shows an abrupt 30cm layer of silty clay containing preserved pollen and freshwater microfossils (diatoms and silicoflagellates) who’s source can be traced back to glacial lakes 200km inland. This layer is positioned between two laminated layers of mud containing marine microfossils.